Michigan’s feral swine numbers are dropping… or are they? Feral swine are known to infect farmland pigs with a variety of diseases that are usually kept well under control in the commercial swine industry. Photo: Michigan Department of Natural Resources. 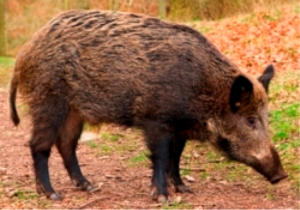 Wild pigs in Michigan are still pests. The number of feral swine significantly decreased according to Department of Natural Resources (DNR) reports but at least one interest group says the numbers are wrong. The report shows three counties – Mecosta, Midland and Saginaw – had the highest numbers of feral swine in 2012.In 2012, there were five sightings and 16 killings of wild swine in Mecosta County. So far this year, the number dropped to no sightings and only six killings. In the three counties with the most animals, more than 40 feral swine were reported in 2012 in contrast to fewer than 10 this year. Mary Kelpinski, executive director of Michigan Pork Producers Association, based in East Lansing, said there is a different explanation for the lack of reported sightings and killings. “The problem is really growing,” Kelpinski said. “It’s just hard to get people to report if there is a sighting — I think in some areas it’s getting to be common. Wild pigs raise concern about infecting farmed pigs, Kelpinski said. Feral pigs are known for destroying land as well, she said. From golf courses and residential property, they have moved to agricultural land. “They dig up a lot of cropland up in the northwest part of Mecosta County. They’ve had quite a problem in the potato industry. They’ve gone in and dug up the fields,” Kelpinski said. “Same for cornfields — you lay down the seed and they’ll go right in in an evening and destroy acres and acres of planted land. Wild pigs are also a problem for natural resources because they are known for attacking small fawns and ground birds, said Kelpinski. They will also compete with native species for food, such as acorns, taking it from smaller animals. There was a release of feral swine in Midland County in the mid—2000s, and the problem grew from there, said Tim Wilson, a wildlife biologist with the DNR. The main goal now is to control or eliminate the swine population to avoid the type of considerable hog damage that has been found in Texas and Florida, he said. It’s difficult to get rid of feral swine due to their elusiveness, said Amy Trotter, resource policy manager at Michigan United Conservation Clubs. The hope is to eliminate them rather than just learning to cope with the problem, said Kelpinski. To help keep them under control, the DNR is asking hunters to shoot a feral pig when they spot it, Wilson said. Hunters need only a regular hunting license. They’re whisperin’ in the hunters ears that farmers don’t own the acorns and windfalls in the orchards off their own trees and any they feed to their pigs is being stole from the deer, and acting like a guy trying to win a bet he has a 5-legged dog by getting their buddy on the county drain commission to pass a rule that in the county a tail counts as a leg. Calling a tail a leg doesn’t make it one. Michigan Pork Producers Association, is still doing its best to wipe out the small farmer who raises hogs traditionally and make anything but raising their industrial pigs in factories illegal, and they’re trying to get the DNR to continue make raising any pork outside a containment facility that sells for premium prices and actually tastes good illegal. They want more rules against it and the DNR to poke its nose into farmers business to wipe out any competition, re-define any pig breeds that they don’t raise in the pig factories as wild animals they have jurisdiction over instead of the domestic animals raised for thousands of year they are. Like the DNR trying to take control over pet dogs by saying t any one that weigh over 50 pounds or has triangle-shaped ears instead of floppy ones or warm fur or that says “woo” and rarely barks like siberian huskies is now a gray wolf or hybrid and its a crime to keep one under DNR regulations, just because they say so. They should make baiting for feral hogs legal, give hunters the edge. The hogs have figured out they’re safe on private property, only one way to get them out of there. It’s my understanding in Texas part of the problem is land owners charge to hunt them, so still protected. Let the hunters bait or drive them, they’ll kill lots of them. Shoot when you see one, not working. A few years ago a guy by Detroit said he killed 4 hogs using canned dog food. If guys think they have a chance to kill one, they’ll go. Put the odds in the hunters favor.